The Paper Landscaper: New Whipper Snapper Release! Hi all! Today Whipper Snapper Designs is releasing two new cling sets by Anna Wight. 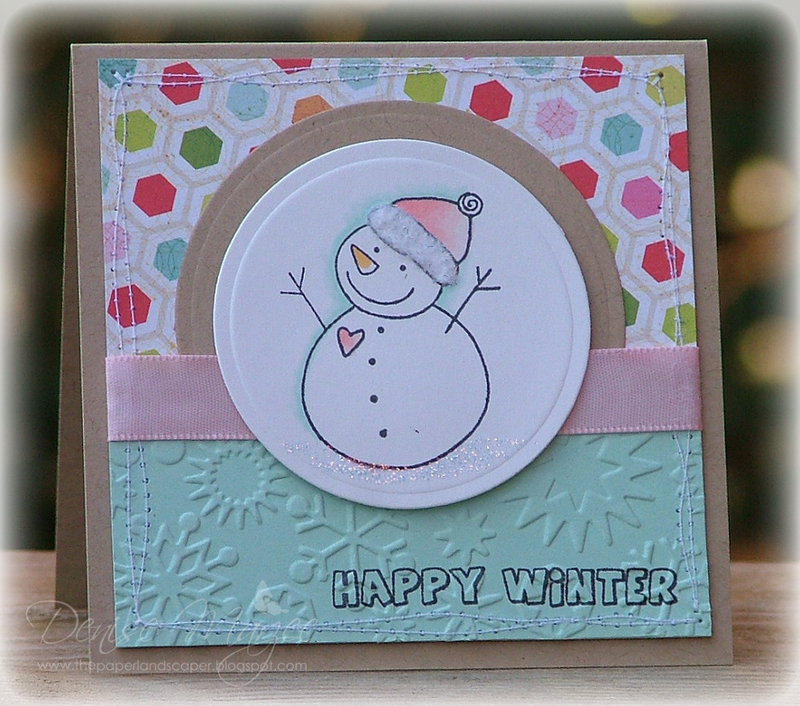 Click HERE to see the featured designers gallery on Splitcoaststampers or HERE to see the sets on Anna's blog. It features a sentiment from the new set called Got Mistletoe. I paired it up with my sweet Bundled Up Mike....one my favorite winter images! I added some Stickles to the snow and pom-pom on his hat. On this one, I used BOTH new sets from Anna. The snowman is from For the Love of Snowmen and the sentiment is from Got Mistletoe. The circle with the snowman is up on foam tape, I added white Sparkly Fluff to the hat, and diamond Stickles to the snow on the ground. Tip: If you want to have a sentiment on an embossed panel, stamp the sentiment first and then emboss it. Thanks for stopping by and I hope you have a really great day. Both cards are precious. And thanks for the tip! Both are just darling Denise! eek! I love them BOTH!!! Totally cute! both of these are adorable, Denise! Oh, how cute! I love that little bear! That bear makes me smile every time I see it. Love his rosy cheeks :) Darling set of cards. How adorable!!! I just love your style, Denise! LOVE the colors you used on both of these!!! I just adore Whipper Snapper stamps!!! I need to use mine more. LOVE LOVE LOVE the way you colored the polar bear!!! So gorgeous cards Denise,I love the images and your papers. I would love to spend a day in your craft room and feed off of your creativity! OMG...that polar bear is so cute!! Both cards are adorble! cute cute CUTE! I love them both! Your coloring is amazing! I love Anna's whimsical images, and your cards are CA-UTE!!! These are both just darling! I love Anna's stuff. Love your style, too. What a great combo! Oooooh, CUTE, CUTE, CUTE!!!!! I LOVE these adorable cards, Denise!!!! The little polar bear is sooo precious and what a darling little snowman!!!! I get the feeling you are enabling me again...LOL!!! SO adorable! Your soft coloring is perfect for these winter cuties! Oh how sweet! Love both of the cards you've created using these darling images. These are both so sweet. I LOVE WSnapper stamps.. Anna's are so fun.. I colored some today. Great job Denise. They are both just TOO CUTE! !